Get the scene: Jesus has been crucified and buried and has raised from the dead. He’d met with his 11 remaining disciples in the upper room and they’d seen him, and at least Thomas had also touched him. He’d met them on the shore of the lake and fixed a fish breakfast – and restored Peter. And now, the time has come for him to return to the Father. You’d think that after all the time they’d spent with Jesus and all that they’d witnessed, they’d have it down by this time, but as verse 17 says, “some doubted.” (Mercifully, the names of those “some” are not revealed to us, or we’d probably criticize them severely.) There were still some who doubted and wondered and were fearful. 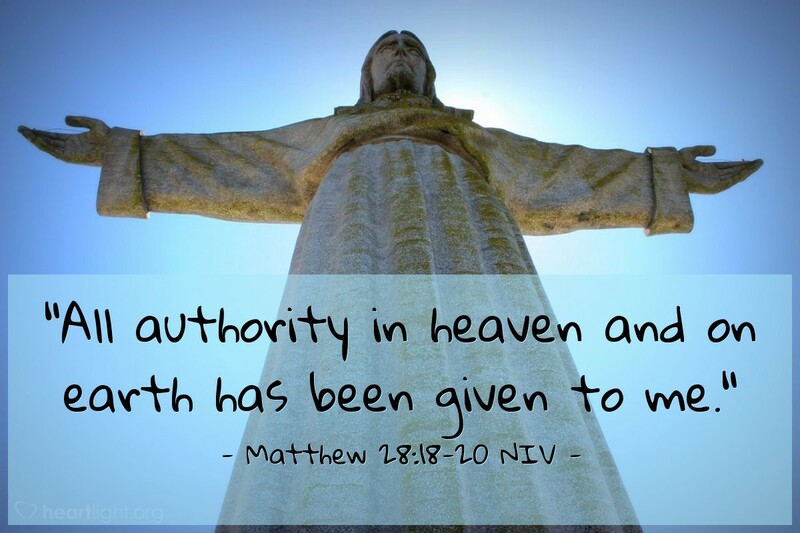 And so, Jesus has a message for them, a message about God having given him ALL authority in heaven and on earth. What was it that Jesus wanted them to understand? That they needn’t fear even one single thing (or any thing) for one simple reason: He has all authority – and control. He has healed the sick, given sight to the blind, strengthened feeble legs so that they could walk, filled the ears of the deaf with the song of birds and laughter, brought the dead to life and even rose from the dead himself. And yet, they still doubted – they still feared. You see, their doubting problem wasn’t caused by some failure in Jesus and how he’d prepared them – it was humanity’s problem of believing what they’d seen and heard him do and not accepting that all authority resides in him. There is no need to fear anybody on earth or in heaven. Why? Because He has all authority! Are you a doubter? Are you fearful? The problem isn’t his – it’s yours – and mine – for not remembering His authority! PRAYER: Lord, quell our fears and doubts, and help us to believe in the full authority of Your Son! In Jesus’ name, Amen.